We are back from London after a wonderful, whirlwind trip! Being away from Kieran is so, so hard, but I am a firm believer that it is also so, so necessary. For him. And for us. As much as we missed him (I started missing him the second we left for the airport), we had such an amazing time in a new place. London was amazing! We initially went to see the Eagles play at Wembley (booked months ago for that reason), but the trip turned into so much more than that. We saw so many things and I’m always in awe of new places. I definitely want to go back! It’s so important as a married couple and as parents to have alone time. While I feel the mom guilt about leaving and crave my son’s presence the entire time we’re away from him, I know it’s time well spent and well earned with my husband. Plus, with another baby on the way, we know our alone time together will become even more of luxury! And now that we’re back home, after a long travel day yesterday, I’m craving my ultimate comfort food: SOUP! 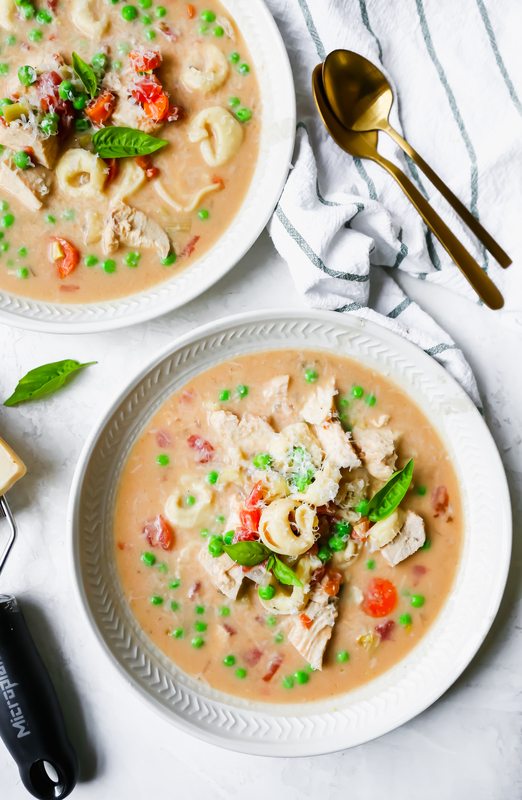 Luckily, before we left, I made a big batch of this creamy chicken tortellini soup and froze half, which means we’re having this for dinner tonight, and I couldn’t be more excited. This soup is just pure COMFORT. It’s like a creamy chicken noodle soup except the noodles are replaced by puffy clouds of tortellini pasta floating throughout. It’s warming and cozy and just what this tired and jetlagged mama needs right now. I seriously can’t wait for dinner. 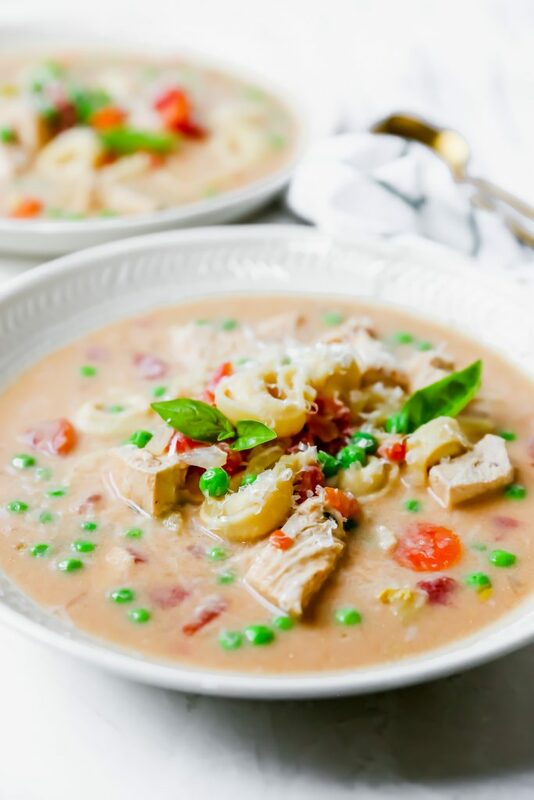 This soup happens in a crock pot, but it would totally work on the stovetop too! I went with the crock pot method because I was going to be home the day I made it and didn’t have time to watch a pot on the stove (mom probs). The crock pot method is perfect for when you’re busy with other things, but still around enough to tend to the soup (it only takes 3-4 hours to cook in the crock pot). It would happen a lot faster on the stovetop but would require more babysitting. Either way, it comes together easily and with staple pantry ingredients. Whenever organic canned tomatoes or broths go on sale at the store, I stock up big time. I realize that makes me sound like an old lady, but seriously, it makes all the difference in the world to have a well-stocked pantry when trying to come up with quick and easy dinner ideas. I almost always have frozen tortellini, ravioli, or gnocchi in the freezer. 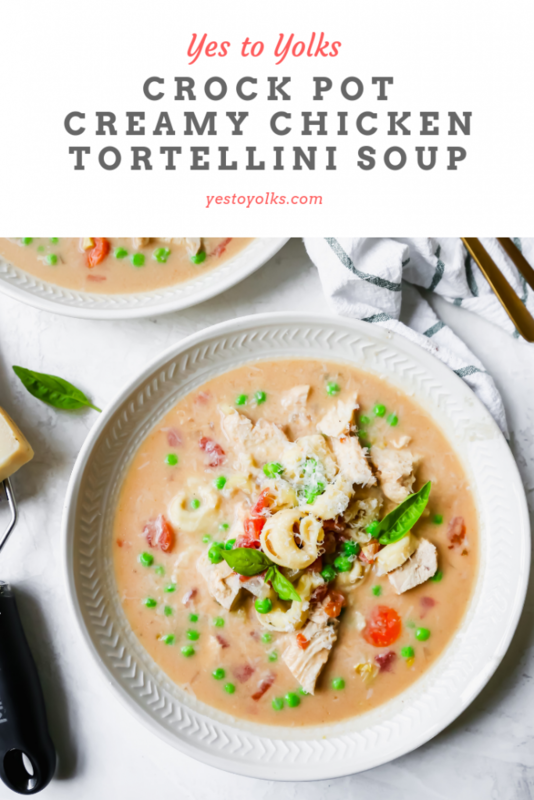 They are an awesome addition to soups like this one, but also lend themselves to quick and easy but delicious pasta dishes as well. I encourage you to stock up next time there is a sale on such ingredients. That’s how this recipe came to be. I needed a quick and easy dinner but didn’t have time that day to run to the store. 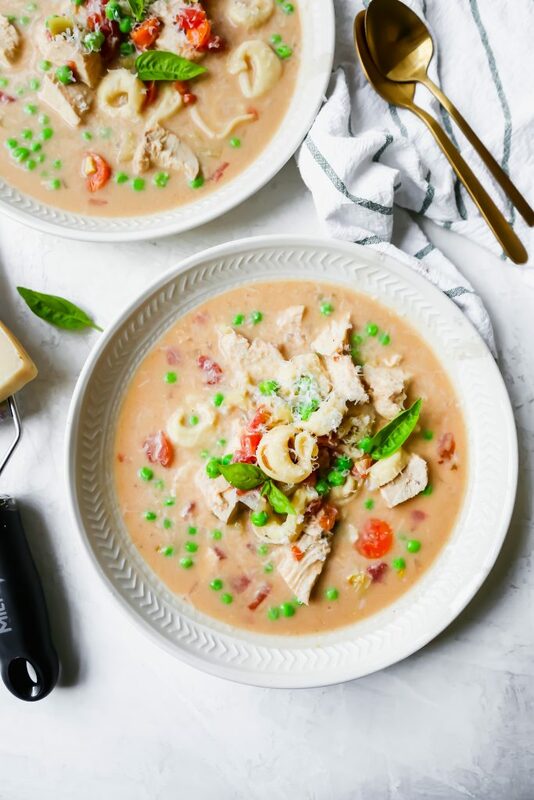 I relied on my pantry and freezer for most of these ingredients and was able to put together an absolutely fabulous, soul-warming meal with very little work. If I may, I suggest making this tonight or tomorrow to have ready for the kiddos before you head out for trick-or-treating tomorrow night! It’ll warm everyone up and keep them satiated before the candy comas set in! Place the chicken, onion, garlic, celery, and carrots in the bottom of a slow cooker/crock pot. Pour over the canned tomatoes and their juices and the chicken stock. Stir gently to combine. Squeeze in the tomato paste and stir until it is mostly incorporated. Add in the sprigs of thyme. Remove the chicken breasts from the pot, shred, and then return to the pot. Remove and discard the thyme sprigs. Whisk together the flour and half-and-half in a measuring cup. Pour it into the soup and cook on HIGH for another hour, or until the soup is creamy and slightly thickened. Add in the tortellini, cover, and cook on HIGH for another 10-15 minutes, or until they have puffed up and are tender. Stir the peas in last – they will defrost in the hot soup in a minute or two. Season, to taste, with additional salt and pepper if needed. 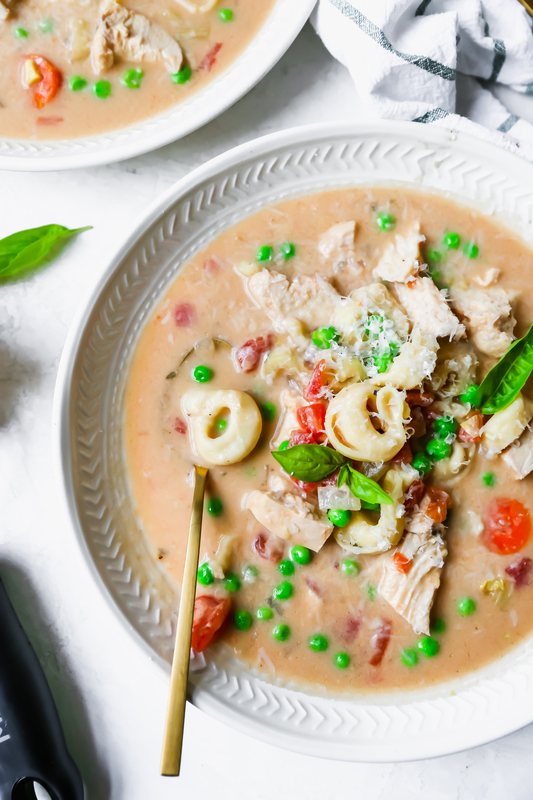 Ladle the soup into bowls and garnish with freshly grated parmesan cheese and a sprinkling of fresh herbs.